The kitchen is where family and friends gather for food and fun, so it’s always got to look its best. 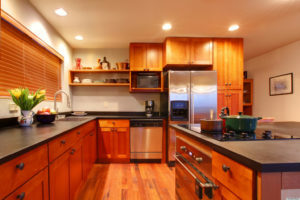 Stop endless dusting, scrubbing, and wiping kitchen surfaces and remodel smart instead! Flat-panel cabinets are easiest to clean, but if they look too modern, shaker-style cabinets are a good compromise. While dark stained cabinets show fingerprints and dust, and white cabinets show absolutely everything else, a medium stained finish is the best choice for effortless style. Otherwise, consider flat painted cabinetry, which is still very durable. Brushed nickel or dark bronze hardware hides water spots and fingerprints well, and quartz countertops are also virtually indestructible. Cornerstone Cabinet Company crafts worry-free kitchens without compromising elegance and quality. For more ideas on how to keep your kitchen looking great without the stress click here.